The operating life of a centrifugal pump is effected by the magnitude of the radial forces. Fundamentally, these forces are due to pressure variations around the impeller periphery which is a result of the complex interaction of two main components; impeller and volute. There are several approaches in the literature for load reduction. Double volute pumps have been successfully used for years. However, this method involves serious manufacturing problems and efficiency losses. This paper aims at using the effectiveness of a new approach called staggered blade arrangement for the reduction of radial forces in a double suction pump. A comparative analysis is performed by judging several key parameters such as pressure, velocity and reaction forces. The accuracy of the developed Computational Fluid Dynamics model was also verified with the pump performance tests. The outcomes of the study revealed that staggered blade arrangement can be used as an effective tool for reducing the radial forces in a centrifugal pump without needing to double volute design. Fujun CGW. Numerical investigation of unsteady pressure fluctuations near volute in a double-suction centrifugal pump. Transactions of the Chinese Society for Agricultural Machinery, 6:015, 2008. Guo P, Luo X, Lu J, Zheng X. Numerical investigation on impeller-volute interaction in a low specific speed centrifugal pump with tongue profile variation. Fluid Machinery and Fluid Mechanics, Springer-Heidelberg, pp 310-315, 2009. Spence R, Aaral-Teixeira J. A cfd parametric study of geometrical variations on the pressure pulsations and performance characteristics of a centrifugal pump. Computational Fluids, 38(6), pp. 1243–1257, 2009. Yao Z, Wang F, Qu L, Xiao R, He C, Wang M. Experimental ınvestigation of time-frequency characteristics of pressure fluctuations in a double-suction centrifugal pump. Journal of Fluids Engineering, 133(10), 101303, 2011. Spence R, Amaral-Teixeira J. Investigation into pressure pulsations in a centrifugal pump using numerical methods supported by ındustrial tests. Computers and Fluids, 37(6), 690-704, 2008. Barrio R, Parrondo J, Blanco E. Numerical analysis of the unsteady flow in the near-tongue region in a volute-type centrifugal pump for different operating points. Computers and Fluids, 39(5), 859-870, 2010. Zhongyong YSNYP, Jianping YUAN. Unsteady turbulent simulation and pressure fluctuation analysis for centrifugal pumps. Chinese Journal of Mechanical Engineering, 22(1), 2009. Khalifa AE, Al-Qutub AM, Ben-Mansour R. Study of pressure fluctuations and ınduced vibration at blade-passing frequencies of a double volute pump. 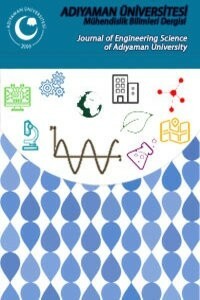 Arabian Journal for Science and Engineering, 36(7), 1333-1345, 2011. Gülich JF. Centrifugal pumps. Springer-Verlag Berlin Heidelberg, Berlin, 996p, 2010. Fujun YMMSW. Numerical simulation of pressure fluctuation and radial force in a double volute pump. Tramsactions of the Chinese Society for Agricultural Machinery, 11:020, 2009. Güelich JF, Bolleter U. Pressure pulsations in centrifugal pumps. Journal of Vibration and Acoustics, 114(2), 272-279, 1992. Zhang N, Yang M, Gao B, Li Z, Ni D. Experimental ınvestigation on unsteady pressure pulsation in a centrifugal pump with special slope volute. Journal of Fluids Engineering, 137(6), 2015. Zhou FM, Wang XF. Effects of staggered blades on the hydraulic characteristics of a 1400-mw canned nuclear coolant pump. Advances in Mechanical Engineering, 8(8), 2016. Alemi H, Nourbakhsh S.A, Raisee M, Najafi AF. Effect of the volute tongue profile on the performance of a low specific speed centrifugal pump. Proceedings of the Institution of Mechanical Engineers, Part A: Journal of Power and Energy, 229(2), 210-220, 2015. Zhang ZC, Wang FJ, Yao ZF, Leng HF, Zhou PJ. Investigation on ımpeller radial force for double-suction centrifugal pump with staggered blade arrangement. In IOP Conference Series: Materials Science and Engineering, Vol. 52, No. 3, p. 032009, 2013. Li WG. Effects of flow rate and viscosity on slip factor of centrifugal pump handling viscous oils. International Journal of Rotating Machinery, 2013. Qiu X, Japikse D, Zhao J, Anderson MR. Analysis and validation of a unified slip factor model for ımpellers at design and off-design conditions. Journal of Turbomachinery, 133(4), 041018, 2011. Caridad JA, Kenyery F. Slip factor for centrifugal ımpellers under single and two-phase flow conditions. Journal of Fluids Engineering, 127(2) 317-321, 2005. Qui X, Mallikarachchi C, Anderson M. A new slip factor model for axial and radial ımpellers. Proceedings of ASME Turbo Expo, 2007. Chen SY, Pang L, Qu YP,. Li WF, Song XQ. Modification of the slip factor of a centrifugal pump considering boundary layer clogging. Journal of Shandong University (Engineering Science), 2:012, 2009. Li H, Rong L, Zhang G. Reliability of turbulence models and mesh types for cfd simulations of a mechanically ventilated pig house containing animals. Biosystems Engineering, 161:37-52, 2017. Limbach P, Müller T, Blume M, Skoda R. Numerical and experimental ınvestigation of the cavitating flow in a low specific speed centrifugal pump with different surface roughness. Journal of Fluids Engineering, 139(10), 101201, 2017. Wilcox DC. Formulation of the k–x turbulence model revisited. AIAA J, 46(11), 2823-2838, 2008. Versteeg HK, Malalasekera W. An ıntroduction to computational fluid dynamics: the finite volume method. Pearson Education, 2007. Murugesan C, Rudramoorthy R. Numerical and experimental study of single stage and multistage centrifugal mixed flow submersible borewell pumps. International Journal of Fluid Machinery and Systems, 9(2), 107-118, 2016. Remaki L, Ramezani A, Blanco JM, Garcia I. New simplified algorithm for the multiple rotating frame approach in computational fluid dynamics. Journal of Fluids Engineering, 139(8), 081104, 2017. ISNAD Kılıçgedik, Hıdır Yankı , Çoban, Mustafa Turhan , Ertöz, Ahmet Özden . "A STUDY ON THE UNSTEADY PRESSURE CHARACTERISTICS IN A DOUBLE SUCTION CENTRIFUGAL PUMP WITH STAGGERED BLADE ARRANGEMENT". Adıyaman Üniversitesi Mühendislik Bilimleri Dergisi 5 / 8 (June 2018): 135-146.